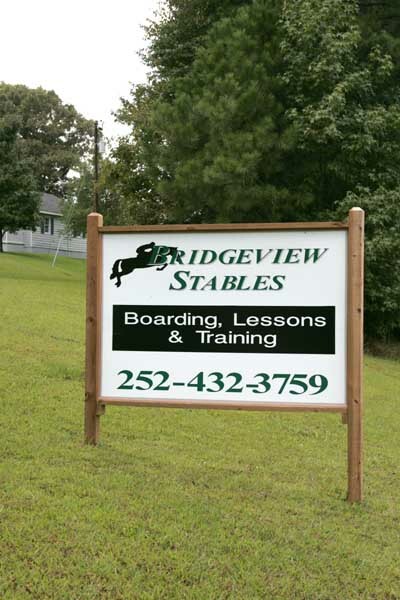 Bridgeview Stables is a beautiful horse farm located on Hwy 39 North near Kerr Lake in Henderson, NC, offering boarding, riding lessons, and training. There are three campgrounds within five miles and other campgrounds within another ten miles. This 19 acre facility is all one pasture right now, but will be divided into smaller pastures in the near future. There is a four stall barn with a tack room, feed room, hot/cold water wash rack, and fly sprayers for all of the stalls. We will be adding four stalls soon and then a large barn in the near future. We have a separate building with seven stalls. We have a lighted riding arena with jumps and a large round pen. There are lots of trails that go around fields on the surrounding property. The horses are cared for by loving hands, as if they are our own. We do not tolerate any abuse of animals here at Bridgeview Stables. Safety of the horses and patrons is our number one concern. Ready to sign up for riding lessons? Want to tour the stables? Contact Bridgeview Stables today!